We had some high permeability toroid cores shipped in. The permeability is so high that it can achieve somewhere between 3-5uH per each winding. 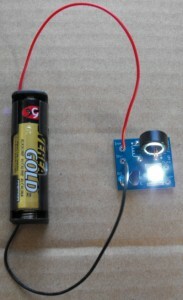 This allows for us to make a High Power Joule Thief with just one winding on each side of the transformer. 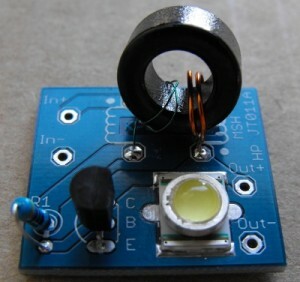 The new one winding Joule Thief is very stable, starts up at below 600mV, and runs very bright at 1.5VDC leaving spots in your vision if you happen to glance at the LED while it is on. These units are assembled, tested, and can be purchased here. Here it is running off of a single AA battery.